Spending our nights out in the wild is one of life’s greatest pleasures. We go back to basics, break free from the tedium of the beaten track, and substitute the hassles of home and the office with the many glories and wonders of nature. Doing it right, however, is much easier said than done, and for the newbie camper there are countless pitfalls to avoid and lessons to be learned before earning the title of “Backcountry Badass” around the campground! Gladly, just a few insider tips and tricks of the trade can make life a whole lot easier, transform your camping experiences from meh into marvelous, and make you as much of the abovesaid badass as any veteran wanderer of the wild out there. 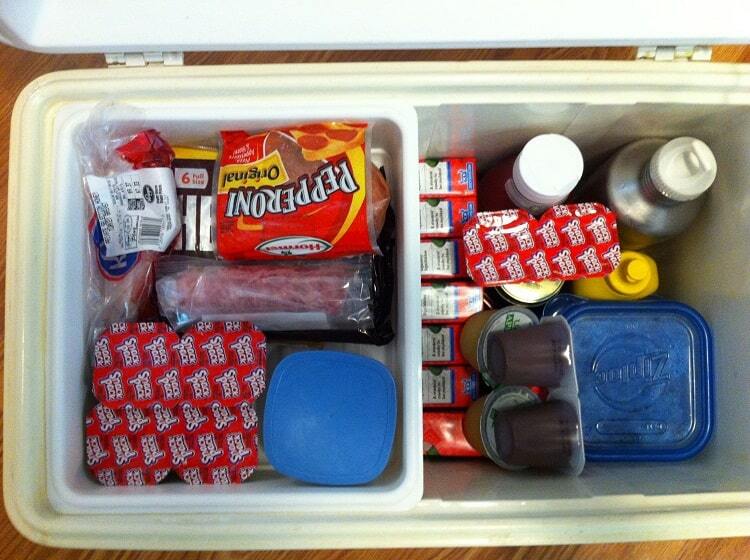 In this article, we’re going to introduce you the very best of them with our list of twenty camping tips and tricks that every novice should know. Many first-time campers underestimate just how tricky it can be to pitch a tent effectively. While this isn’t likely to be a big problem if you rock up at your campsite early and have several hours to get things in order before nightfall, if you happen to arrive late or the weather takes a turn for the worse, then you could be in for a very, very long night! 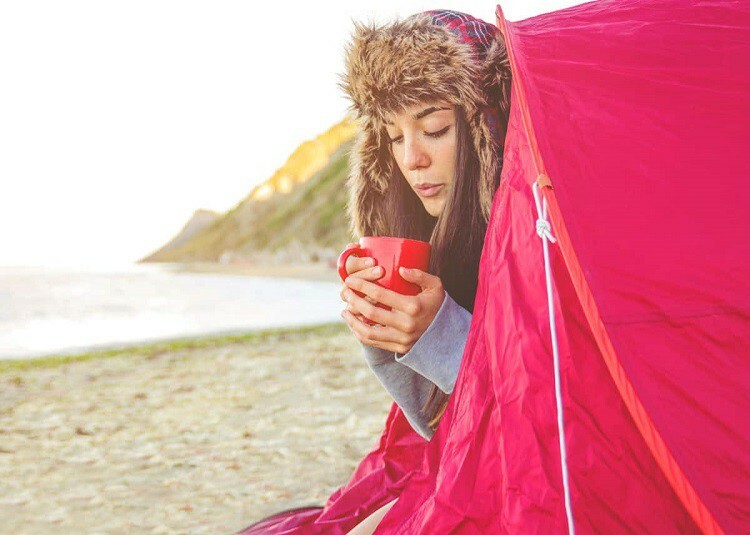 Ideally, you should practice pitching your tent at least four or five times in your garden or a local park before venturing out on your first camping trip. To make it less of a chore, each time you do so set the timer on your watch and try to beat your previous performance. This tip, we should add, applies to all gear items—becoming familiar with their setup and workings before you go can save you a lot of hassle and frustration (not to mention the scorn of your camping cohorts!) when out in the wild. 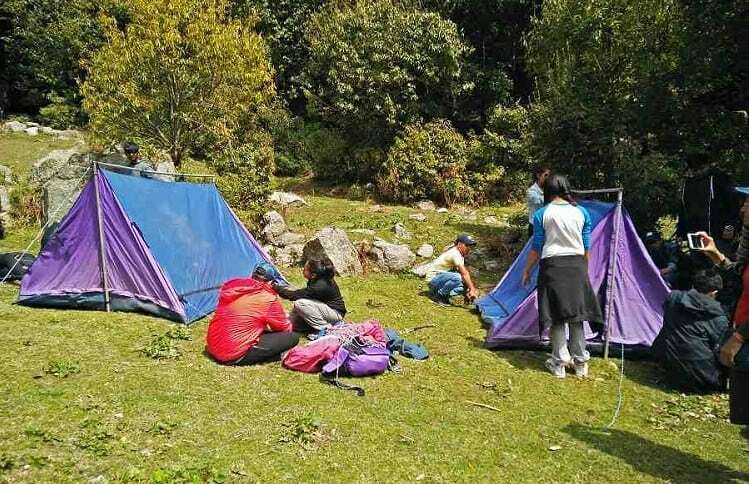 Many newbie campers are apt to think that any old dry and relatively flat patch of terrain will serve their purposes when pitching their tent. While this may be the case if luck is on your side, there are a few other factors to be considered to ensure you’ve chosen the best spot for a safe and sound night’s sleep. First up, look for natural windbreaks such as knolls, boulders, or trees—even if the wind isn’t blowing when you pitch up, that doesn’t mean it won’t kick up at some point during the night. Secondly, look up. Are there any large or rotten branches above your prospective pitching place? If so, relocating might be in order. High winds, heavy rain, and snow can all cause branches to break off and make an impromptu, unwelcome, and potentially deadly landing in your campsite. Finally, if you are camping in mountainous terrain, be sure to check your tent will not be in the path or fall line of any snow or rocks should there happen to be an avalanche or rockslide. As with the branches mentioned above, there are far better ways to go…! One of the more notable hardships of backcountry camping are the cool morning temps, particularly if you’re doing that camping in high, mountainous terrain. Depending on how much of a morning person you are, the prospect of getting out of your sleeping bag and getting the coffee boiled and the fire started on such mornings is unlikely to fill you with too much enthusiasm. Making things more comfortable in the a.m., however, simply requires a little bit of foresight in the p.m. When pitching your tent, do so in a spot where you’ll have the most exposure to the morning sun—that is, to the east—and let the big yella fella do his thing before venturing out into the open. 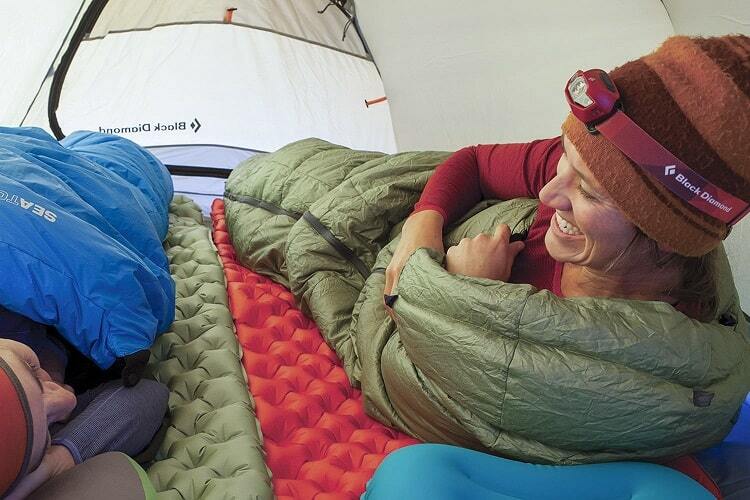 Carrying a pillow with you on your camping adventures might save you a smidgen of mild discomfort come bedtime, but it’s also going to take up a lot of precious pack space and, no doubt, earn you a just a little bit of ridicule from your co-campers! 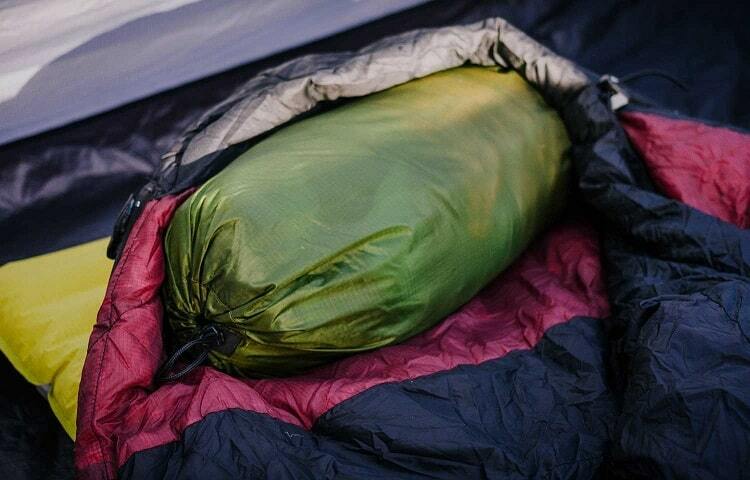 Contrary to what many of us are apt to think, sleeping bags work by insulating (i.e. trapping) body heat rather than actively producing warmth. What this means for us campers is that crawling into our sleeping bag cold is the surest way to ensure we stay that way for quite some time and, of course, have a rough night’s sleep (or lack of, as the case may be) as a result. To avoid this inconvenience, before getting into your sleeping bag at night do a few quick exercises outside of the tent to warm yourself up—star jumps, jogging on the spot, press ups, or any other exercise that’s going to get your blood moving and raise your core temperature. Getting out of your warm sleeping bag in the middle of the night to answer nature’s calls is undoubtedly one of camping’s less endearing eventualities. It usually goes something like this: we tuck ourselves in for the night, listen to the start of a rain shower spattering on the walls of our tent, and happily count our blessings that we’re safe and sheltered away inside the cozy cocoon of our sleeping bag and tent. Then, disaster strikes: we realize we gotta go. Option one entails biting the bullet and getting wet, cold, and inevitably stubbing a toe or nearly poking an eye out on an overhanging branch when fumbling through the dark towards a suitable pee spot and then spending the next hour or so trying to fall asleep again. Option two entails none of the above, allowing you take care of business without having to leave the comfort of your tent thanks to the wide-rimmed water bottle or bladder you brought along with you for precisely this purpose. *For female campers, the SheWee Female Urine Device will make life a lot easier! *Needless to say, we’d highly recommend you carefully color code your bottles so you don’t mix up your pee bottle with your drinking one! Few things are quite so capable of ruining our good time in the great outdoors as the humble but horrendously irksome mosquito. These miniature, modern-day pterodactyls have driven many a camper absolutely nuts over the years and even caused a few us—the author included—to pack up and head home prematurely rather than spend another minute on the receiving end of their wrath. 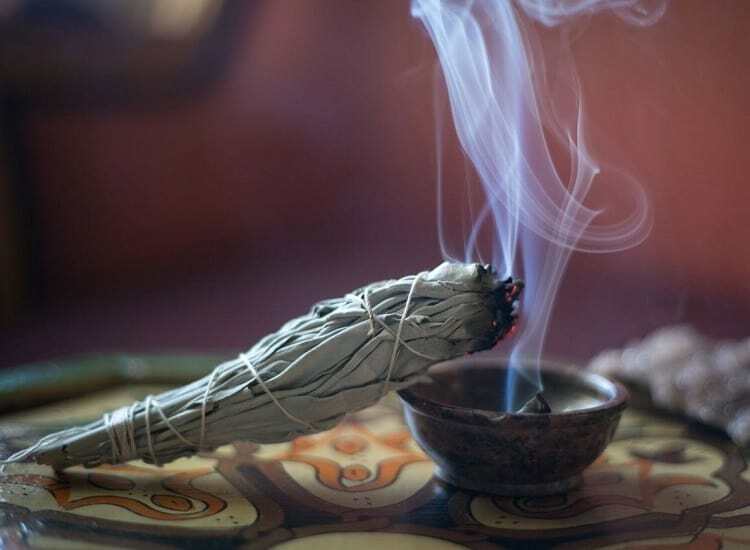 Well, one of the most effective means of repelling mosquitoes is burning sage around your campsite. It might not be the most high-tech backcountry accessory out there, but the humble trash can liner has oodles of potential uses for the savvy camper. No matter the conditions outside, putting on damp, cold clothes in the morning is never an enjoyable experience. Owing to the cool ambient air circulating inside your tent and most tents’ tendency to soak up with condensation during the night, however, for many campers that clammy morning reclothing routine is part and parcel of the camping experience. It is also, we’re glad to tell you, very easily avoided. When hitting the hay at night, simply stuff your clothes (and boots if possible) into the bottom of your sleeping bag and let your body heat do the rest. If there’s no room inside your sleeping bag, you can lay your clothes out on top of your sleeping pad before getting into your bag and in the morning they’ll at least be a whole lot warmer and drier than if you’d left them in your pack or on the tent floor. Sitting around a roaring fire at the end of a day’s hiking is one of camping’s greatest pleasures. 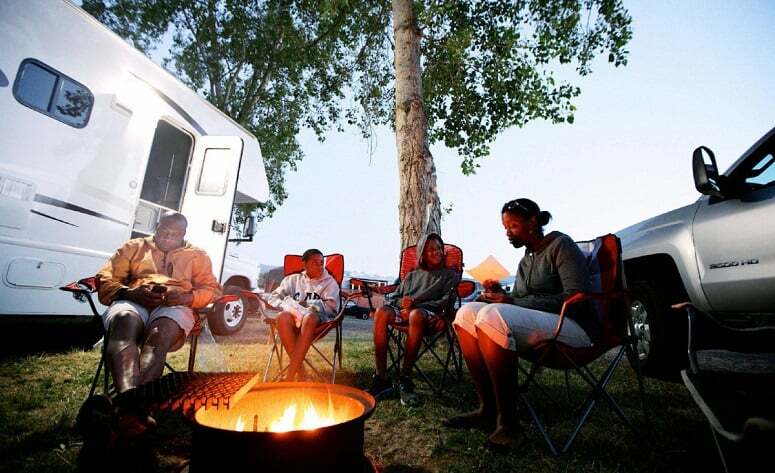 This being so, rolling into your proposed camping spot only to find there’s a distinct shortage of wood or what’s there is too damp to burn is a bit of a party pooper. Even in dry conditions and with ample kindling, getting your campfire up and running can be a tricky business. To simplify things, before you set off, dip a few cotton balls in Vaseline or petroleum jelly and stash them in a ziplock bag in your backpack and you’ll have your fire going in no time. It’s cheap, easy, and more effective than the oft-advised combo of newspaper and firelighters. While the cotton balls mentioned above will serve as an ideal firestarter, they won’t be of much use if there’s no dry kindling, branches, or logs in the area in which you’re doing your camping. If you’re especially keen on having a campfire, a simple and highly effective way to make sure you don’t have to go without in either wet conditions or tree-free locations is to pack an egg box with a few lumps of charcoal and set it atop your cotton balls. It’s light, fast, and has a reasonable burn time for such a portable and lightweight fuel source. Sometimes, finding a perfectly flat spot to pitch your tent just isn’t possible, particularly if you’re camping in mountainous backcountry terrain. If forced to pitch your tent on a slope, position the tent so that the top end is on the high side. This will not only prevent blood rushing to your head during the night and giving you a headache but also ensure that any condensation inside the tent drip towards your feet instead of your face. Although ridge tents have gone ever so slightly out of fashion in recent years, they still have their merits and uses, particularly when it comes to making weight savings in your pack. With most ridge tents, it’s possible to leave the structural poles behind and simply use your trekking poles to keep the tent upright. This trick may only save you a few ounces of weight, but if you’re on a long thru-hike or backpacking trip your back and knees will thank you for it! Instead of running all of your group’s headlamps and blinding each other every five seconds as you shift about the inside of your tent, fill up a clear water bottle, aim the beam of your headlamp into the bottle, and let there be (soft, warm, non-blinding) light! Many of the zippers we find on outdoor gear items, sadly, aren’t made with cold and/or wet-handed campers in mind. When our hands are numb or damp, or it’s dark and we don’t have our headlamp handy, trying to open or close the zippers on our gear can test our patience to the max and empty our wallets of many a dollar gone the way of the swear jar. To simplify matters and save yourself a lot of fumbling and frustration, tie a small loop of string through the eyelets of your zippers or clip on small carabiners. If you have some glow-in-the-dark tape to stick on them, all the better! Most hikers and backpackers carry some form of bivvy bag to use in case of an emergency. These lightweight potential lifesavers usually take the form of a bright orange polythene affair or the affectionately named mylar “space blanket” and spend, in most cases, year upon year of their existence stowed in the bottom of their owner’s pack without ever seeing the light of day. Instead of following suit and leaving your bivvy to lead a life of shiftless luxury, we highly recommend you make your it earn its place at the party! This can be done by using your bivvy as a simple doormat or groundsheet in the porch area of your tent or by attaching it to the tent with guy lines or door ties and suspending it over the entrance, thereby creating a makeshift awning that will provide additional dry storage space. In warm weather, the interior of a tent can very quickly come to feel like a steam room or small, sticky, and usually odorous torture chamber. The obvious course of action in such a scenario is to simply open all the vents and pray that any marauding insects have already had their lunch and are doing their hunting elsewhere. A less obvious but equally effective method of keeping things tolerably cool is to use the same reflective emergency bivvy bag mentioned above to deflect the sun’s rays by laying it against the wall of your tent that is most exposed to the sun. Granted, it’s not quite the same as having built-in A/C, but it’s not a bad solution in a bind! When eating at a camping table, there’s always a chance that a few “locals” whose names didn’t make it onto the invitation list will nonetheless make their way to the party by way of the table legs. To deny these gatecrashers access to your dinner, place each leg of the table in a small, water-filled tub, tray, or jar to make a simple but highly effective bug-barrier. Setting up your stove and cooking kit and then spending half an hour or so waiting for your dinner to cook at the end of a long day’s hiking is no fun at all. Pre-preparing your meals so they’re good to go when you are will not only let you avoid the horrors of post-hike hunger but also let you cut down on mess (and, hence, cleaning), weight (cooked items generally weigh less than uncooked and you’ll need fewer utensils), and earn some serious kudos from your hunger-stricken camping companions. One of the biggest mistakes we see made by novice and old-hand campers alike is carrying way too much gear. Over the years we’ve seen teddy bears, at least a dozen volumes of Harry Potter, laptops, elaborate kitchenware and cooking sets, cans of soda, and even the odd musical instrument. While a lightweight creature comfort or two might be excusable if we’re pitching our tent close to where we park the car, if we’re doing our camping deep in the backcountry then our efforts to replicate the setup we have at home will only detract from the backcountry experience. More importantly, unless we happen to have a personal Sherpa who’s going to carry all those added items for us, then our chances of enjoying the trek out to our desired camping spot—if, indeed, we make it that far—become slimmer with each additional pound of nonessential items weighing down our pack. Our advice? If you can live without it, go without it. Commit fully to the outdoor experience and enjoy it for what it is—your toys and trinkets will be waiting for you when you get home; nature will not. In the many years I’ve spent camping around the globe, I’ve seen just about every rookie camping error there is to be made. I’m not too proud to admit, moreover, that I’ve made a fair few of them myself. Luckily, these experiences, combined with the help of the people I met along the way, have given me a wealth of insights into the ways in which camping can be made a whole lot easier and more enjoyable for anyone and everyone. In sharing the above tips, it’s my wish that newcomers to the world of camping can avoid the long process of trial and error that so many newbie campers go through and skip straight to the fun! So, how did you like our list? If we missed anything out, please feel free to point it out in the comments box below!